Writers coin hundreds, perhaps thousands, of words each day to wax over the history and debate the composition of this week’s cocktail, the Martini. We can’t, and won’t, try to match any of it. What we will say is that the weather is getting nippy, we are cooking richer dishes and many holiday parties are on the horizon. Our tastes tend to shift with the season, and these days we start to crave the occasional Martini. Regardless of all the blather endless conversation, a good Martini is still a delight. 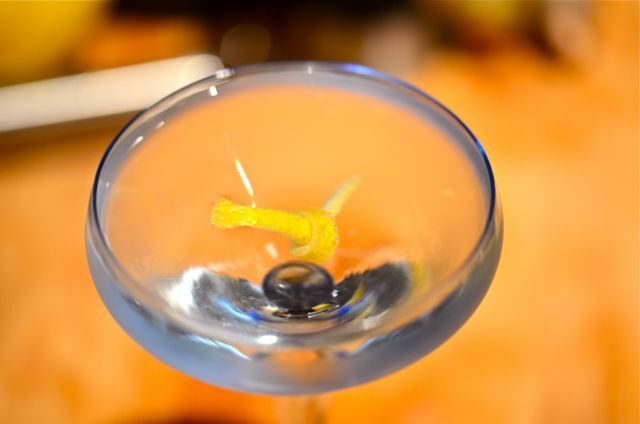 Clean, cold and elegant, and with crisp, bracing flavors, a Martini is a good start to a special evening. (A few more can also be a very poor end to an evening, but we will leave that to Dorothy Parker). 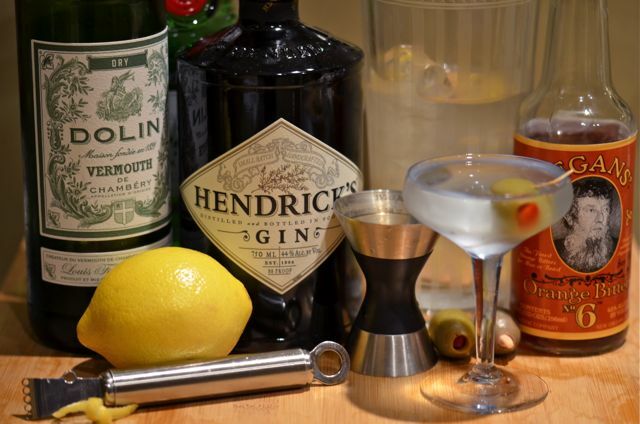 Ironically, for all the “best”, “only way”, or “classic” interpretations of the Martini, the recipe has been in flux throughout the Martini’s history. The only real constants are gin (yes, only gin) and vermouth. And that’s it, otherwise the variables are endless. Early recipes used Old Tom gin and sweet vermouth, some Plymouth gin and a mix of sweet and dry vermouth, later recipes London dry gin and dry vermouth. And the ratios are simply all over the place. Even the best cocktail books and writers simply don’t agree. Some recipes go 50/50 vermouth to dry gin (most recipes these days use dry gin) and some still use just the lightest hint of vermouth, others include a dash of bitters. And, of course, you have the preparation and garnish. The amount of back-and-forth over shaken vs. stirred and olive vs. a lemon twist already fill a few volumes. In fact, the one thing we can say with confidence is that if someone tells you they know the “best” or “only” way to make a Martini, they really don’t know what they are talking about. All they really know is how they like “their” Martini. 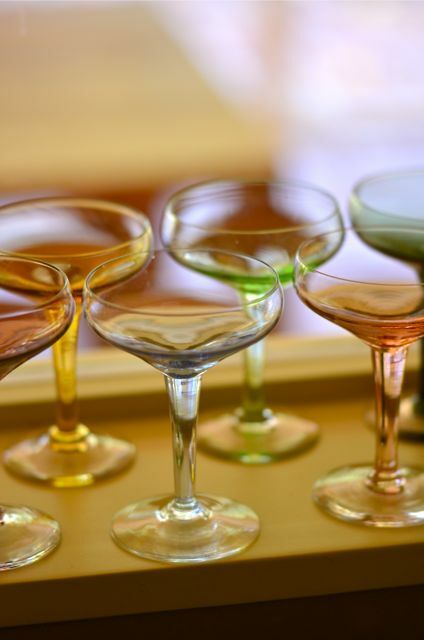 If you like a good Martini, you need to try a number of variations and decide what you like. This is a good thing. And while you experiment, we do suggest you consider a few things. Firstly, vermouth isn’t an afterthought. There are many quality vermouths out there from the inexpensive (Noilly-Pratt) to the premium (Dolin). And if you keep them in the fridge they actually taste good. No need to skimp. Try recipes that use more vermouth, you may be surprised. Secondly, the world of gin is exploding with multiple flavor profiles. Good London dry gin and Plymouth are still heavy on juniper, but “new world” gins like Hendrick’s and Nolet’s focus on flavors like cucumber or rose petals (we tend to like the old standby of Tanqueray and the occasional dalliance with Hendrick’s, but that’s just us). Third, we suggest you play around on the edges, try a dash of orange bitters, experiment with olives and twists depending on the gin or vermouth you use. Finally, it makes sense to keep your Martinis small so they don’t warm up, a cold Martini is a good martini. And feel free to shake or stir, just be sure to do it until the Martini is very, very cold. 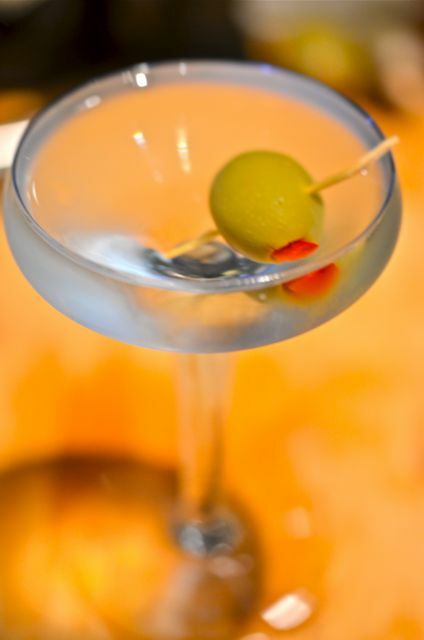 Right now, we enjoy Dolin dry vermouth and have it highlight our Martinis. We use a decent slug of vermouth with dry gin and we also enjoy an “old-school” variation and include some orange bitters. As for olives or a twist, it depends on our mood and if we need a quick appetizer, but we like the lemon oil from the twist. So our current recipe is 1 and 1/2 oz. dry gin, 3/4 oz. dry vermouth, a dash of Regan’s Orange Bitters #6 and a lemon twist. We have a cool mixing glass, so we stir. But do what you like. Enjoy yourself. And one last note. Few cocktails match the spare, timeless elegance of the martini. The shaker, the glass, the olive all look beautiful and harken back to the art-deco designs and speakeasies of the 1920’s. Having a Martini is a special event, a small step back in time, an escape. And we celebrate that. 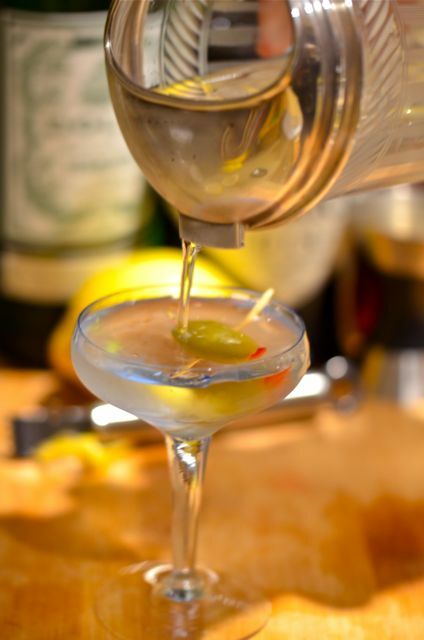 However you make it, take the time to make your Martini well. Pull out some of your best glasses and maybe even a silver tray. Pick out some good music to play. Maybe invite over a few good friends. Serve your Martini with style, it will pay you back handsomely. Combine the gin, vermouth and bitters in a mixing glass with ice. Stir until very cold and strain into a chilled cocktail glass or coupé. Squeeze the twist over the drink and then place it in the glass. Serve. Fascinating. I didn’t know there were “better” vermouths, or that you should keep them in the fridge… or that New World gin was a thing. So thanks for educating me. 🙂 Time for some new experimentation with a classic! The “experimentation” is certainly fun. But for what it’s worth, the vermouth in the fridge (or buying small bottles regularly) is the key. You will be surprised how easily you can taste the difference. A Martini is never wrong – love the way you have taken the photos of the glasses. Very artistic. A girlfriend and I was visiting one of London’s top restaurants at that time and we wanted a dry martini and a Frozen Margarita – they gave my friend just a vermouth and they could only give me a strawberry margarita – they didn’t have any frozen – hey ???? They could have done with you as bar manager. And all bars need to make a good martini and a margarita! Great to have your thoughts on this uber classic. I prefer your type of balance to those that suggest there should only be the slightest taste of Vermouth. Great images as always! Great timing–just saw the latest James Bond movie:-) A Martini sounds like a wonderful idea. Thanks! Always a wonderful idea…. Or, you could use an orange twist, if you don’t have the orange bitters on hand. Tackling the big one! I like it. I completely agree with you definition of Martini. In my book leaving it wider than gin and vermouth is no longer a Martini and being stricter about garnishes and ratios is just stupid. Only, I’m a bit of a stickler about stirring. Personally I go for 2 oz gin to 1/2 oz vermouth with a dash of orange bitters, as my standby. Lemon or olive depending on my mood, and the gin, but lemon twist more often. I’m almost finished a massive right up of a gin-tasting we did, and of the seven gins we tried, the ones we liked best for Martinis were Tanqueray, The Botanist and Martin Miller. Need to try the Martin Miller. We do like the Botanist and it is funny that Tanqueray still holds it’s own for a lot of drinks..
We are of two minds on stir / shake. We normally stir (and have a few mixing glasses we like). But sometimes the small shards of ice in a shaken version seem right (if technically incorrect).. I just want to note, that when I read your blog, it’s through a weekly digest. So every Monday morning, I get an email with you week’s past posts. And usually the first post of the week involves alcohol. What a wonderful way to start my week! Mmmm … My favorite cocktail is the martini, with 3 blue cheese stuffed olives. There’s just something elegant about holding a glass of martini. Elegant is the word…and everyone does have “their” version…part of the fun. Us too, we need to see it! Fantastic glasses – fabulous photographs. Even at 9:15am on Tuesday morning this is appealing! An excellent article and a great choice of Vermouth 😉 We always stir our Martini. If you shake it, it becomes a Bradford. Thanks! We just learned about the Bradford / shaken… had no idea..